Now I know when it comes to a chocolate chip cookie recipe there are a thousand out there and I probably have never made the same recipe over and over again! 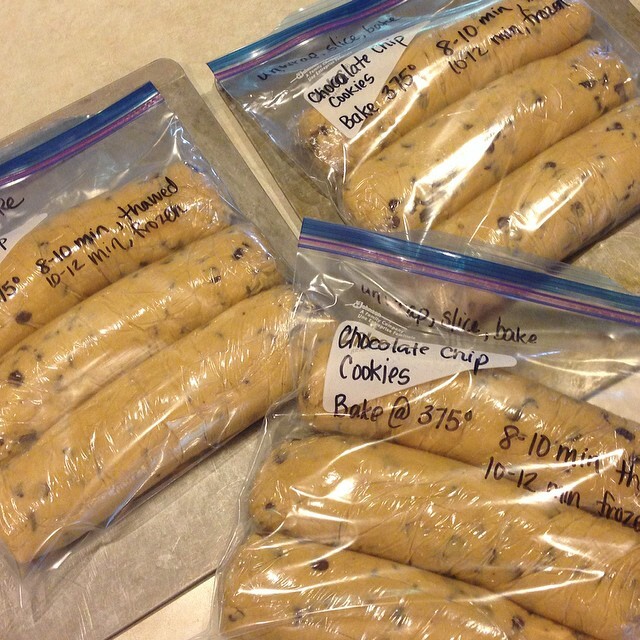 Since the group of us girls that did the freezer meals ran out of time last Sunday, I had planned on making up the cookie dough with the help of my oldest daughter … who bless her soul is becoming very much like her mother (SO SCARY!). However, I could NOT decide which recipe to use for our freezer cookie dough. As my daughter and I were getting prepped to start our mass cookie dough making extravaganza, I happened to be on the phone with my sister who has an unbelievable taste for her sweets and since she lives overseas depends on most of her homemade recipes to fulfill her good-ole America treats! All of a sudden it dawned on me … if anybody has a good go-to recipe for chocolate chip cookies it’d be her! She is the master of tweaking and using what you have to make it exactly like you want! And sure enough, she did with a few tweaks of course!!! Her inspiration came from Better Homes and Gardens recipe. Their recipe calls for shortening but for me personally I’ve never been a fan. I’m not a shortening snob and would never be able to tell if something was made with margarine, oil, or shortening, but there’s something about adding a big glop of colorless greasy substance to recipes. Beat oil, butter, sugars, and soda until combined. Beat in eggs and vanilla. Add flour until well combined. Stir in chocolate chips. Drop by rounded teaspoons 2 inches apart on an ungreased cookie sheet. Bake at 375˚ for 8 to 10 minutes. Makes about 4-5 dozen cookies. These are by far the best chocolate chip cookies I’ve made! They keep their shape and are so soft! For the freezer, place three strips of plastic wrap approximately 12 to 18 inches in length on the counter. Divide the cookie dough evenly between the 3 pieces of plastic wrap. Form into logs and wrap up. Place in a gallon-size freezer bag.